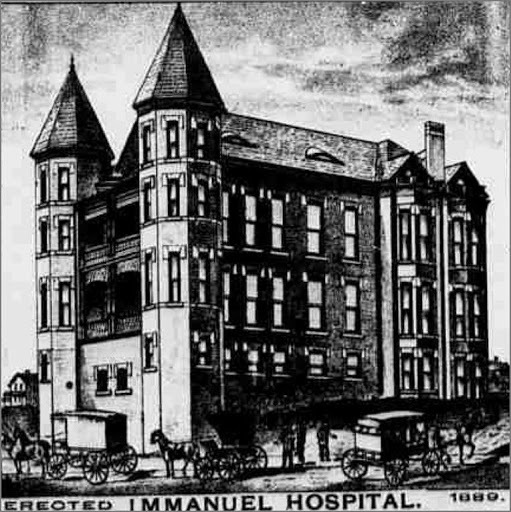 The Immanuel Hospital as it appeared in 1889. Special thanks to Ryan Roenfeld for locating this image. 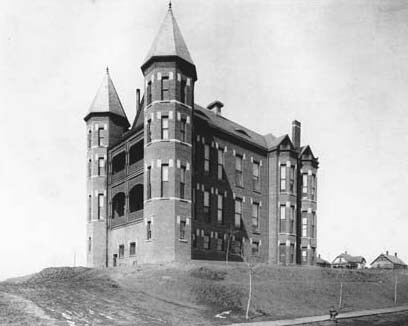 The Institute ran several facilities at this location, including a children’s home, an old folks home, a nursing school, and the hospital. 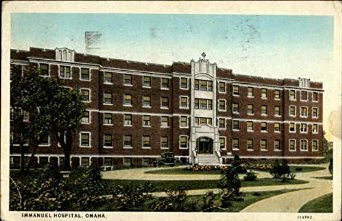 When it closed, there were 20 buildings for the institute, including Immanuel Hospital, in the Monmouth Park neighborhood of North Omaha. 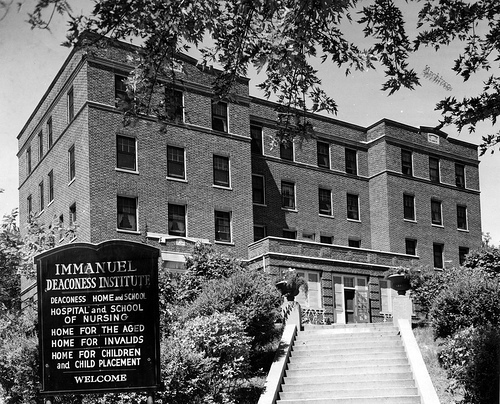 Following is a short history of the Immanuel Deaconess Institute, Immanuel Hospital and more. An insurance map from 1901 showing the blank slate that became a massive institution. Special thanks to Micah Evans for locating this! In 1879, the Rev. Erik Alfred (E.A.) Fogelstrom came to Nebraska to serve the Swedish population in Omaha as pastor of Immanuel Lutheran Church. His vision included building a medical institution to serve the growing population of North Omaha. On October 8, 1887, Pastor Fogelstrom and others organized the Evangelical Lutheran Immanuel Association for Works for Charity. Pastor Fogelstrom created Immanuel Hospital and Deaconess Motherhouse in Omaha in 1890. After sending women to Philadelphia and Sweden for training as deaconesses, Fogelstrom was determined the engage his Omaha congregation in this work. The Institute served this purpose for more than 75 years. The first step was for the Lutheran Church to serve the old and infirm of the community. 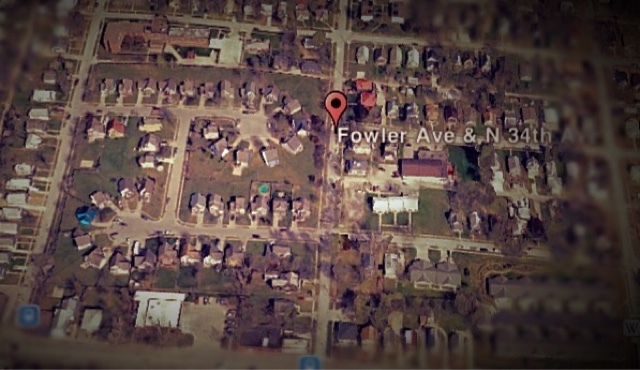 Concerned primarily with the Scandinavian and German immigrants in the area, the church located land at N. 34th and Fowler Streets. 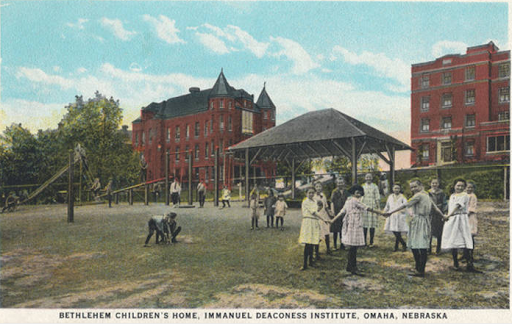 The Immanuel Deaconess Home for the aged and infirm was opened by 1890 in North Omaha. 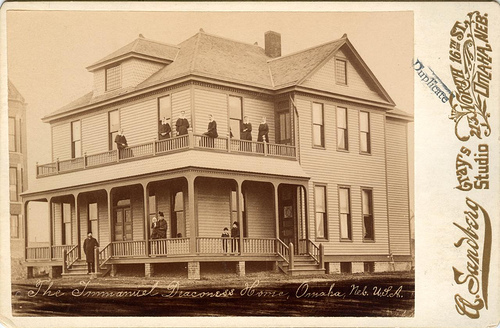 The Immanuel Deaconess Home at N. 34th and Fowler Streets in North Omaha, circa 1891. This is the hospital shortly after its completion in 1891. By 1891, the hospital was completed and the first four deaconesses began their work at the hospital. There was also a Immanuel Children’s Home built in 1901. The orphan houses; the old peoples’ hospital; the new hospital; the old institute building. The community‘s needs outpaced the first hospital, located at 36th and Meredith, and a new hospital was opened in 1910 in the same area. The original building became the Nazareth Home, which served people who were elderly and those who had severe disabilities. This is the northwest corner of the hospital in 1910. The car is at the entrance to the hospital. This is the entire Immanuel Deaconess Institute along Meredith Avenue. The deaconess living quarters are in the middle, the Bethlehem Children’s Home is on the right, and the first hospital is on the left. 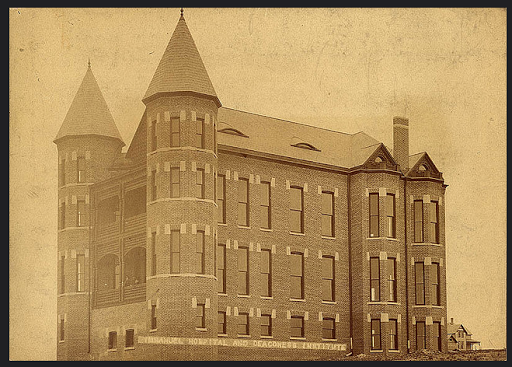 The Immanuel Children’s Home was built in 1901 housed 21 girls and 16 boys. It was also called the Home for Children and Child Placement. A second house was built in the 1920s for older children and was called the Bethlehem Children’s Home. 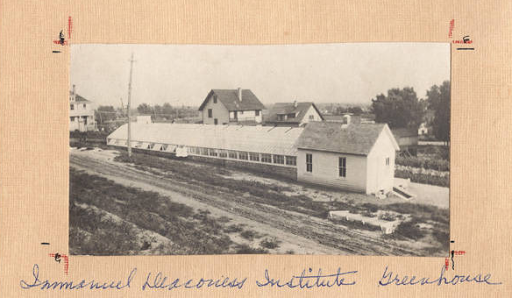 The long, narrow building here is the greenhouse for the Institute, circa 1922. 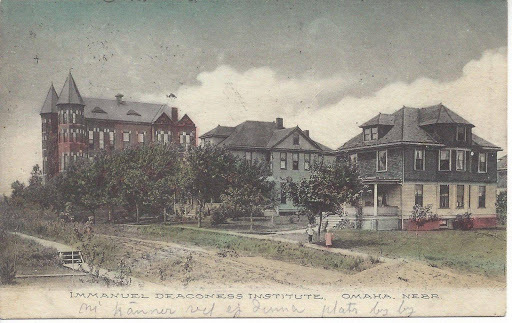 This is a circa 1910 postcard for the Immanuel Deaconess Institute in North Omaha. It shows (from left) the Orphan’s Home, Hospital, Parsonage, Deaconess Home and Nazareth House. Each of these has their own history, as well as the collective history of the entire institution. This is the Immanuel Lutheran Chapel at N. 34th and Fowler, which operated from 1914 through 1972. During this era, the Immanuel Chapel was also built. A Lutheran church, it was ministered by Pastor Fogelstrom, and stayed open through the life of the Immanuel Deaconess Institute. 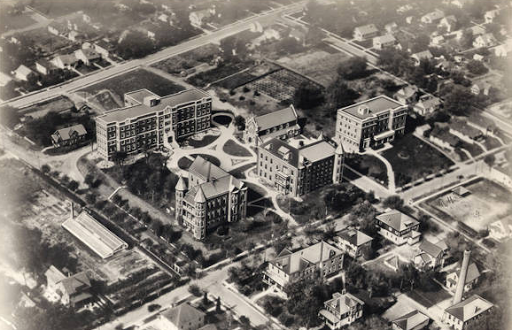 An aerial shot of the Institute in 1922, including the third, second, and first hospitals, and more. 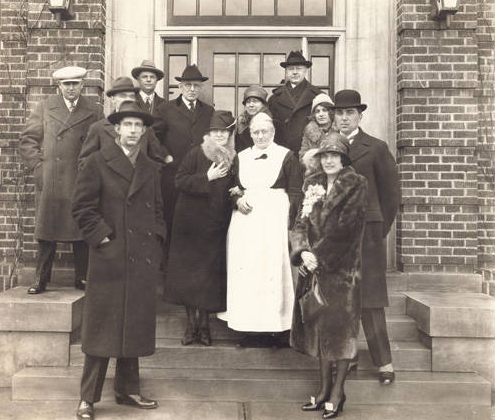 The need for hospital beds continued to grow and a third hospital was opened on the 36th and Meredith site in 1926. The first two buildings were remodeled and services for the elderly and those with disabilities were expanded. 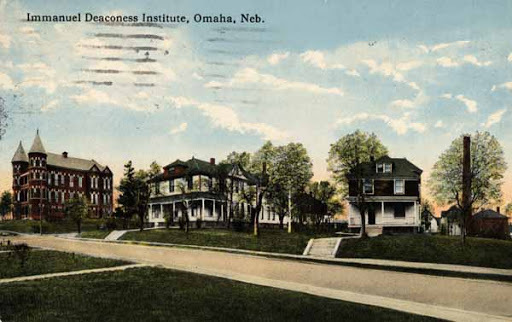 Immanuel Deaconess Institute in 1922. These kids are from the Bethlehem Children’s Home, which is not actually pictured here (see above). This postcard is circa 1925. Throughout all these years, the Immanuel Deaconess Institute and Hospital maintained its identity as a Swedish institution. In 1927, the Duke of Södermanland, Prince Wilhelm of Sweden. Traveling with dignitaries and others, he toured, ate and reviewed the entire campus in May of that year. Prince Wilhelm stands on the bottom step at the left in this photo from the front of the Institute. 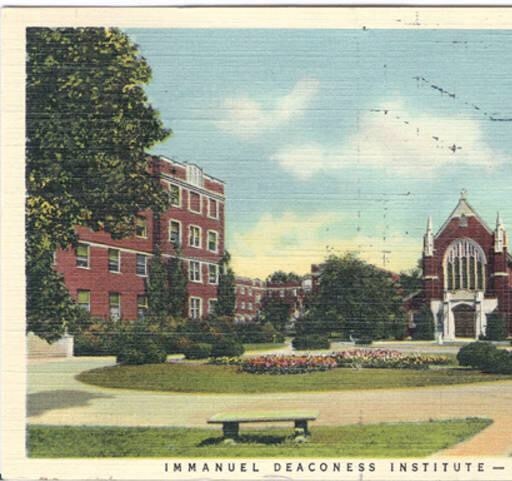 Immanuel Deaconess Institute, opened in 1890. Immanuel Hospital, opened in 1891. Immanuel Children’s Home, opened in 1901. 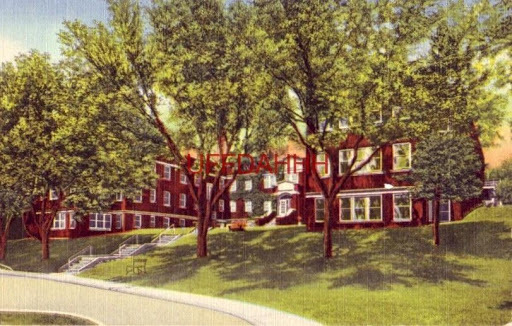 Bethlehem Children’s Home, opened in 1920. Fifteen graduates wear white nursing uniforms with white pointed caps, which signifies they are nurses with RN degrees. Two graduates on opposite ends of the group wear white nursing uniforms with domed caps fastened around their chins by a strap and bow, which signifies they are both nurses with RN degrees and deaconesses. The Immanuel Nursing School was a part of the Immanuel Deaconess Institute from the beginning. 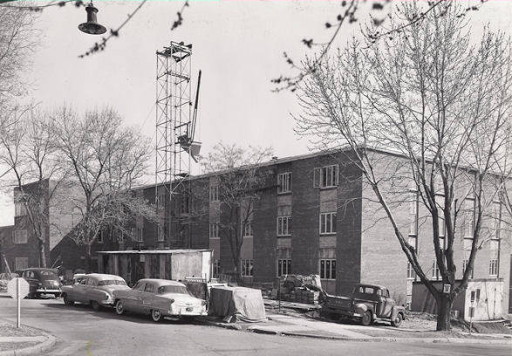 In 1954, the last major addition to North Omaha’s Immanuel campus was a new building for the school, which was located at North 36th & Larimore. 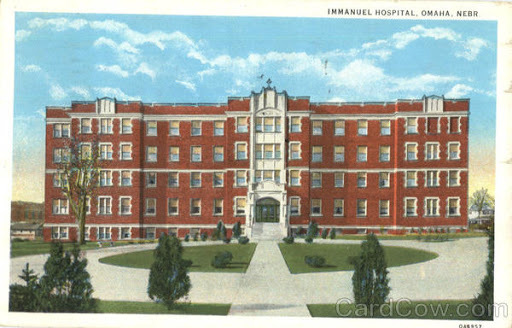 The third Immanuel Hospital in approximately 1945. The Institute and the Chapel, circa 1937. 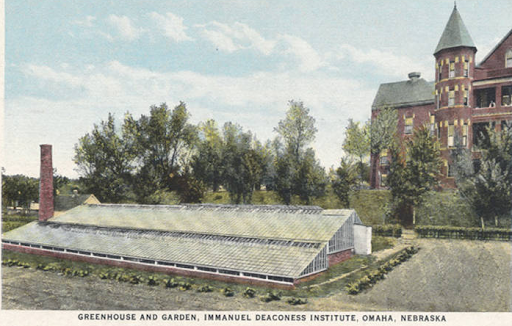 The greenhouse at Immanuel Deaconess circa 1937. The Immanuel Home for the Aged, circa 1940. An aerial photo of the Immanuel Deaconess Institute in 1937. Upper left is the third hospital; the buildings with the spires are the first and second hospitals. The large smokestack belongs to the laundry facility for the institute. Other buildings include the Children’s Home, the Old People’s Home, and the Institute offices. During the 1950s there was a period of growth and reconstruction, and a six-story hospital wing doubled the size of the hospital. The six-story addition to the third Immanuel Hospital is located on the left side of this picture. The growth came to an end soon afterwards though. This is an aerial photo of Immanuel in 1971. Planning for the current Immanuel Medical Center began in the early 1960s when it became apparent that, in order to meet its healthcare commitments, Immanuel would have to expand. 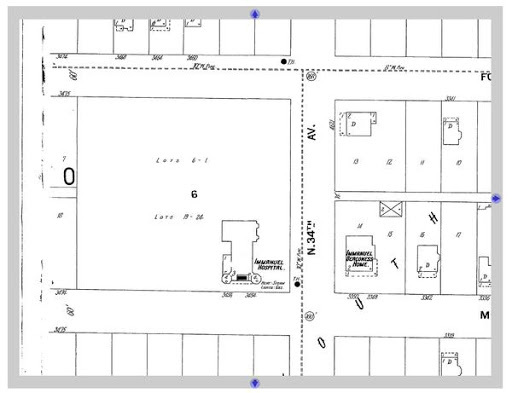 The present 166-acre site at 72nd and Sorensen Parkway was purchased in 1966. The new Immanuel Medical Center opened on June 29, 1974. Recognizing the benefits of alliances in healthcare, Bergan Mercy Health System and Immanuel Medical Center came together to form Alegent Health in June 1996. In 2012, Catholic Health Initiatives (CHI Health) assumed control of the Immanuel Medical Center to form an institution that controls 15 acute care hospitals, four behavioral health facilities, two specialty hospitals, over 120 clinics, and multiple health services across the Nebraska and Iowa region. The last surviving building of the Immanuel Deaconess Institute served as an alcohol and drug treatment center for more than 40 years. The NOVA (New Options Values and Achievements) Therapeutic Community Partial Care was located at North 3482 Larimore Avenue. Although its still standing today, the building is now boarded up with an uncertain future. Much of this legacy began in North Omaha. The hyperlocal healthcare provided by this institution is long gone now, with all of the land redeveloped and gone. Immanuel lives on in North Omaha history though, and this has been a little of its history. The last surviving building of the Immanuel Deaconess Institute, boarded up and waiting for the wrecking ball at N. 36th and Larimore Streets. 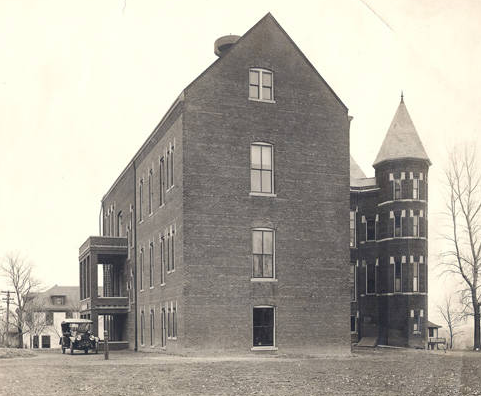 The first Immanuel Hospital and Deaconess Institute, circa 1891. Here’s Prince Wilhelm and his entourage dining at the Institute. 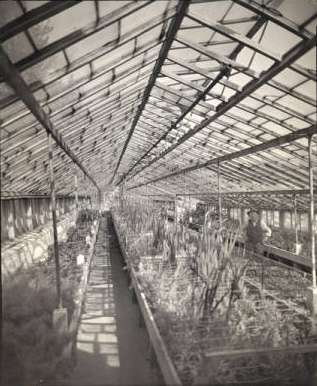 A picture of the interior of the greenhouse in 1925. A 1964 insurance map of the Immanuel campus, showing the full slate it had become. Special thanks to Micah Evans for locating this for me! 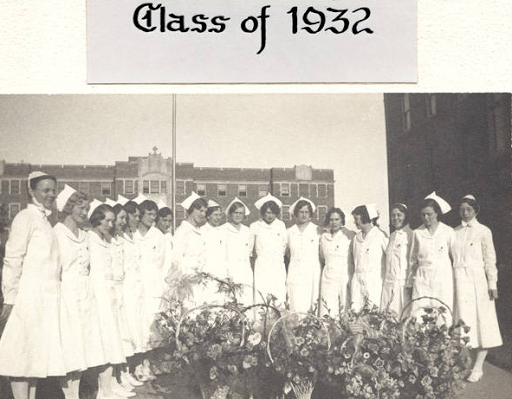 This is a 1948 picture of Immanuel Deaconess Institute’s Nursing School capping ceremony, held on campus in the Bloom Hall auditorium. 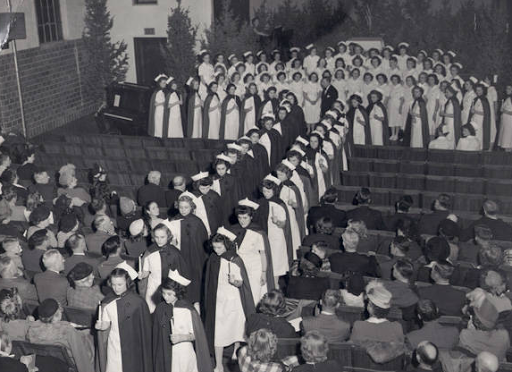 The nursing students are wearing their full uniforms, including caps and capes, and holding candles. This is my favorite image related to the Immanuel Deaconess Institute. Vibrant and broody. Nazareth Home is in the foreground, and the second Immanuel Hospital is in the background. This postcard is circa 1920. This is the new Immanuel School of Nursing under construction in 1954. 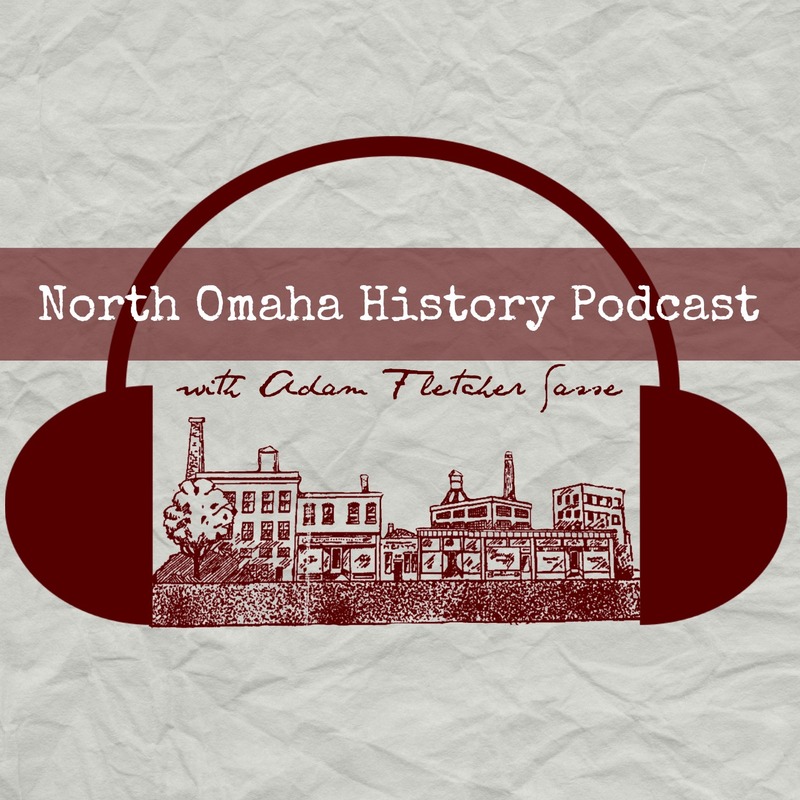 The last major construction on the North Omaha campus, it was located at North 36th and Larimore. This is a 1958 aerial pic of the Immanuel Hospital at N. 34th and Meredith Avenue. 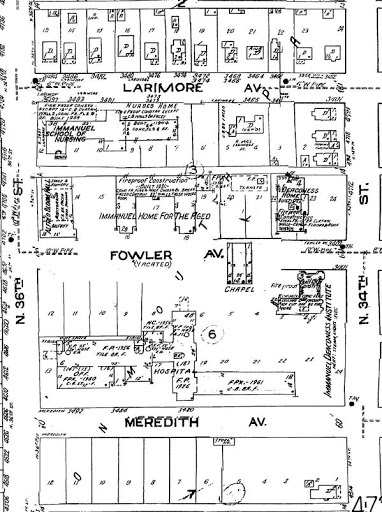 In the early 1970's, some of the houses along Larimore had been subdivided into apartments. I was at a party in one of them one night when folks started asking if anyone knew this group of 3 young women. When I asked who they knew there, they admitted no one, they were nursing students who would walk down Larimore looking for a party with lots of guests so go on in. Around that same time, my mom's visiting nurse asked her and I to come and speak to her students about our experiences with my mom's rheumatoid arthritis, which we did, speaking in the building on Larimore behind the hospital. And even earlier than that, my younger brother had to be hospitalized for a wee bit, and my older brother and I would only visit with him by waving at him thru the window of his ground floor hospital room. Before the hospital was bulldozed, there was a catering business operating out of the old cafeteria and a health clinic being operated out of a patient floor. I know there were other areas being used but cannot recall any more detail offhand. Yvonne, thank you so much for sharing this! I remember when they town down the original hospital in the late 80s, but I have no memories of it open – before my time! Thank you so much for this story. I was born there, my mother worked there as a teenager and my grandmother volunteered there. So much family history there. Our Schnack family grew up in Harlan, Iowa. Any relation? Graduated from Immanuel as an RN 1966. You’re welcome Margaret. Researching and writing these, I hope to spark memories from people like you who lived this history – I appreciate your comment! In helping look for my Swedish cousin’s missing aunt Alma Matilda, who family only knew as having left Sweden for “Omhah” in 1889, then was never heard from afterwards, I traced her here. My cousin’s will be coming to visit her grave this summer, and would have enjoyed walking the old buildings of Deaconess Home, etc had they still been there. Alma was there throughout all the growth years. She’s buried in Forest Lawn as Sister Alma Olofson 1874-1962. She was born Alma Mathilda Olofsdotter in Hälla, Risinge, Östergötland. Later, several of Alma’s younger siblings also immigrated to NYC along with my grandmother, their cousin. I’m sure my cousin’s will be pleased to see what a lovely place Alma lived in, through the photos in this article. Thanks so much! Thank you for letting me know that Kate! I hope that you keep looking for more of Alma’s history. You might check with the Durham Museum in Omaha for more information about the Deaconess Home, too. Best wishes! Sorry about that repeat post above. I’m looking to find a guide through the above mentioned cemetery, Deaconess or anyone who may have known Alma. Would you suggest anyone I could connect with? My first cousin once removed Helen Eriksson formerly a deaconess with the Immanuel Deaconess Institute passed away Oct 26th/2017 in Edmonton, Alberta. She was 6 months short of her 100th birthday. Thank you James for lEttinger us know about Sister Helen. We know she is rejoicing with her Lord! I worked at Immanuel for 7 months in 1956 in the dining room and kitchen of what we then called the “Invalid” home. That is where I learned how special the developmentally disabled can be. Sister Maurine Lindahl was my boss and Sister Astrid Erling was a good friend. I came from a small town in Iowa but at Immanuel I learned to respect the less fortunate. There was an African American young Creighton University student who worked nights and I learned that skin color is just that and there are wonderful people everywhere. I am now 81 years old and have been grateful to Immanuel, the deaconesses, the wonderful patients and the chapel for some necessary life lessons. When I was in Omaha just a few years ago and saw a housing development there now, I couldn’t believe that all those marvelous old red brick buildings were completely gone!